Are you looking for a quiet place to spend with your special someone? 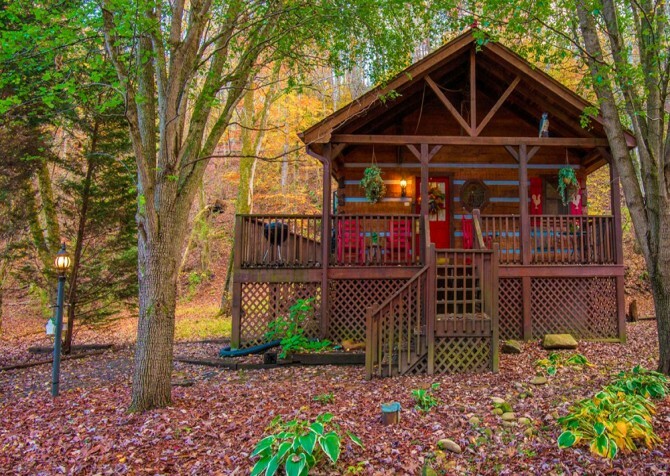 How about an adorable—and affordable—Pigeon Forge cabin that overlooks the Smoky Mountains? 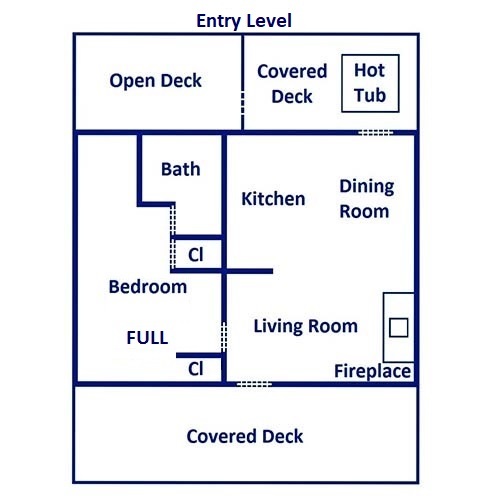 How about a 1-bedroom, 1-bathroom cabin that comes with your favorite romantic amenities like a screened-in hot tub and an indoor jetted tub? If all that sounds like what you’re looking for, then you need to check out Happy Days! 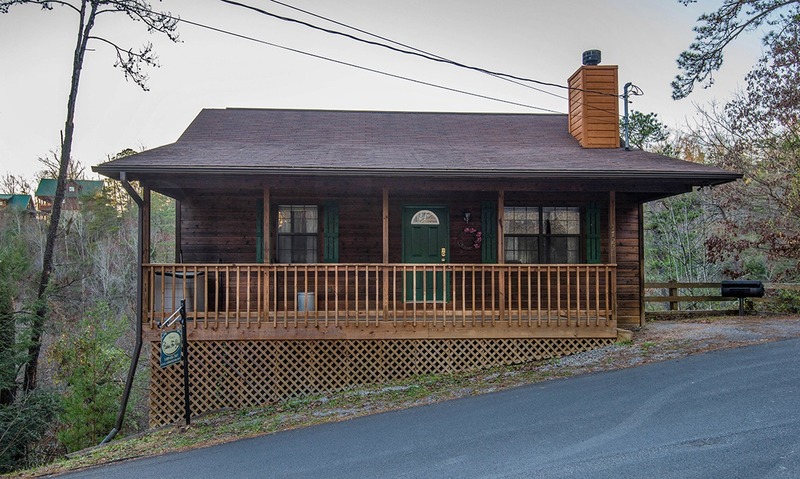 This 1-bedroom cabin, located only 5 miles from downtown Pigeon Forge, is ideal for couples hoping to find a romantic escape in the Smokies. But with its additional sleeper, it can also work for families of 4 traveling to the Smoky Mountains for a much-needed getaway. Enjoy amazing views, comfortable living spaces, and all the comforts of home inside Happy Days! Your long trip to the Smoky Mountains will all be worth it once you arrive at Happy Days. 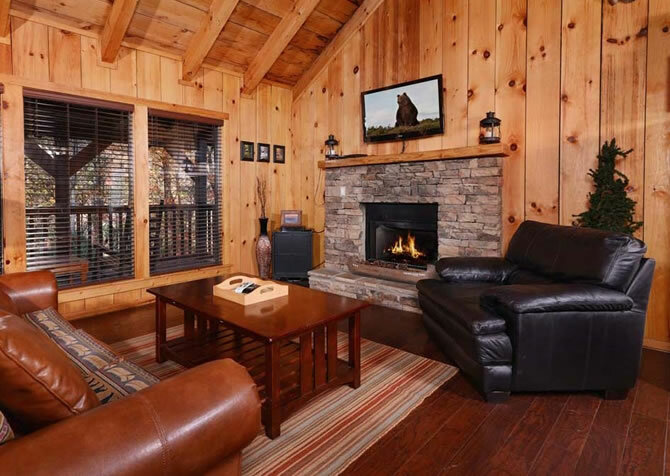 Just say “ahhh” as you step into this cabin’s living room and sink into its comfortable suede couch or coordinating chair. Everything you need from home and more can be found in this cozy cabin’s living room, including a ceiling fan, a large coffee table for drinks and snacks, and even a stone-set wood-burning fireplace. Plan for nights around the fire with your sweetie and your favorite flavor of Smoky Mountain wine. 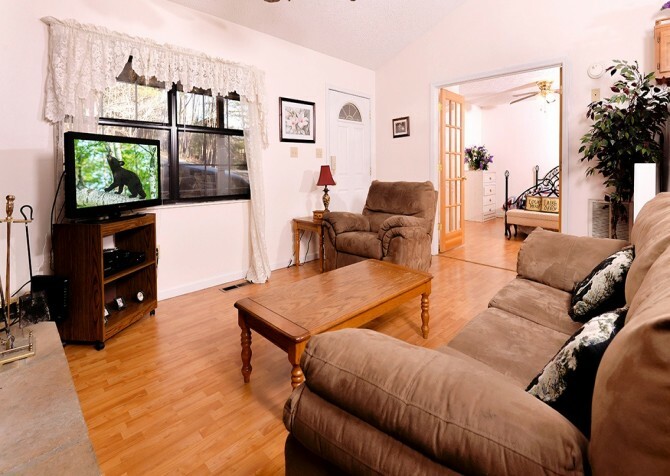 Or you can cuddle up on the couch to watch your favorite television program on the big screen TV. You can even rent a new release and plan for a movie night using the DVD player that conveniently comes with Happy Days. And when you’re in the mood for something a little different, clear the coffee table and challenge each other to a game of Scrabble, or you can work together to finish a puzzle you haven’t had time for at home. Enjoying the Smoky Mountains doesn’t have to mean expensive outings and late nights downtown. There are plenty of happy times to be found simply being together inside Happy Days! The open kitchen inside Happy Days is just the right size for a 2- to 4-person getaway in Pigeon Forge. You won’t struggle for cabinet space—there’s plenty of room for storing any snacks, drinks, or goodies that you’ve brought along. You’ll also find all the major appliances in this cabin, including a microwave, dishwasher, oven/stove, and refrigerator. If you’re craving a cup of Joe in the mornings, no problem! 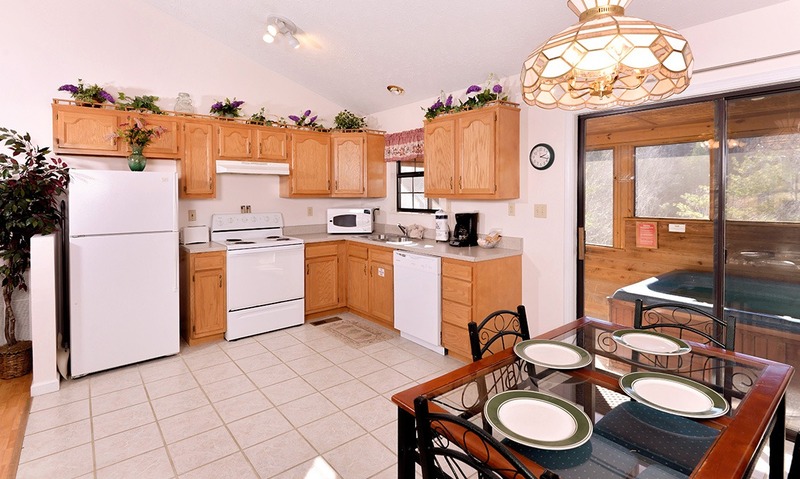 Happy Days comes with a coffeemaker and a toaster for easy breakfasts in the cabin. Pick up a loaf of bread and your favorite fruit butter from The Old Mill General Store in Pigeon Forge, and you’ve got an easy, delicious breakfast without having to get out of your pajamas! And the best part about making your own meals in the cabin is you can enjoy them together in the privacy and comfort of your cabin. No fighting traffic or scrambling to get the best seat. 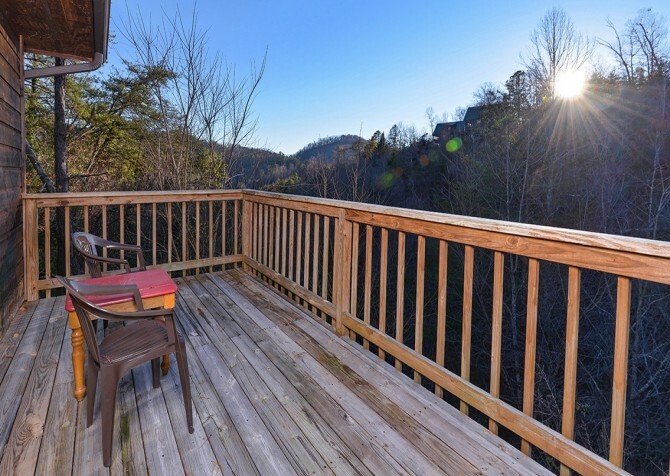 You’ve got the best view in the house right from your very own back porch! 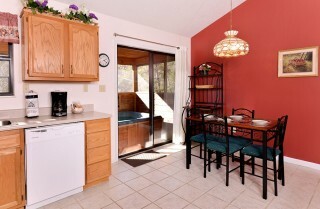 On those days you do decide to make your meals in the cabin, take advantage of the Happy Days dining space. With its glass-top table and black iron chairs, this modern dining room table provides space enough for 4 to enjoy homemade meals inside the cabin. And you can’t beat the dining room’s view! 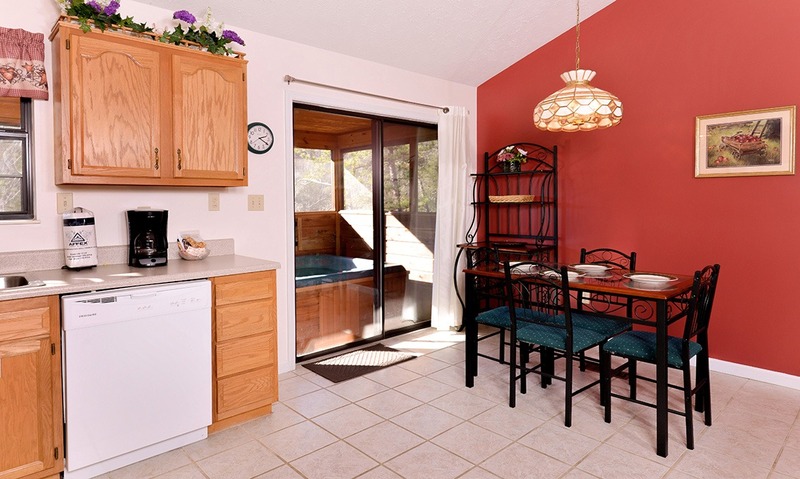 Two sliding glass doors provide generous amounts of natural light while you eat and a gorgeous view of the Smoky Mountain trees. 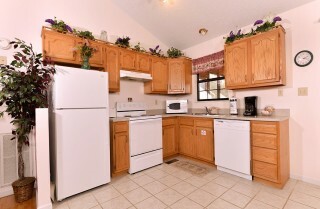 Conveniently, the dining space of Happy Days also comes with a small hutch where you can place your food during mealtime. And when you’re done eating, clear the table and use it to set up your favorite board games or a card game for a night of indoor fun! 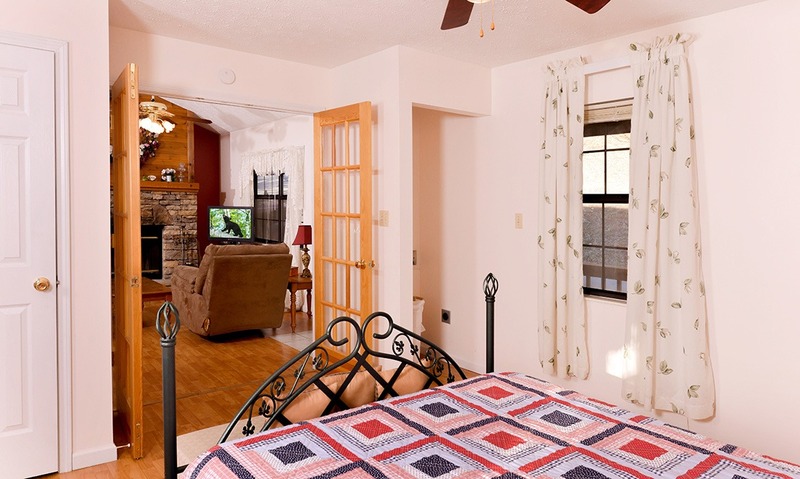 Happy Days comes with 1 bedroom and 1 bathroom—everything you need for a romantic getaway for 2! French doors on the main floor open to reveal the cozy bedroom inside this cabin. 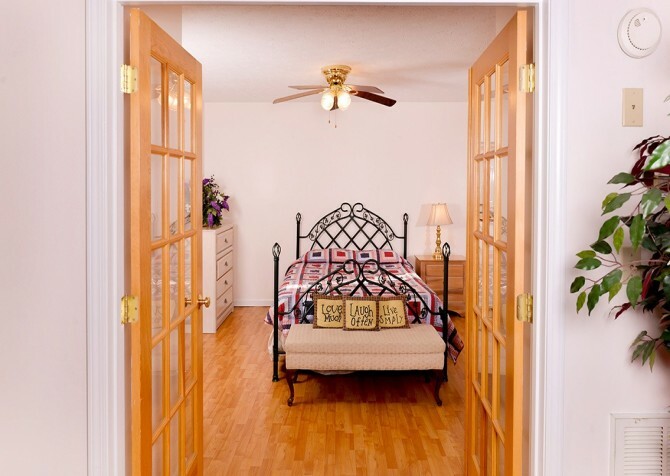 Enjoy a full-size bed with an iron frame and all the added comforts of home. 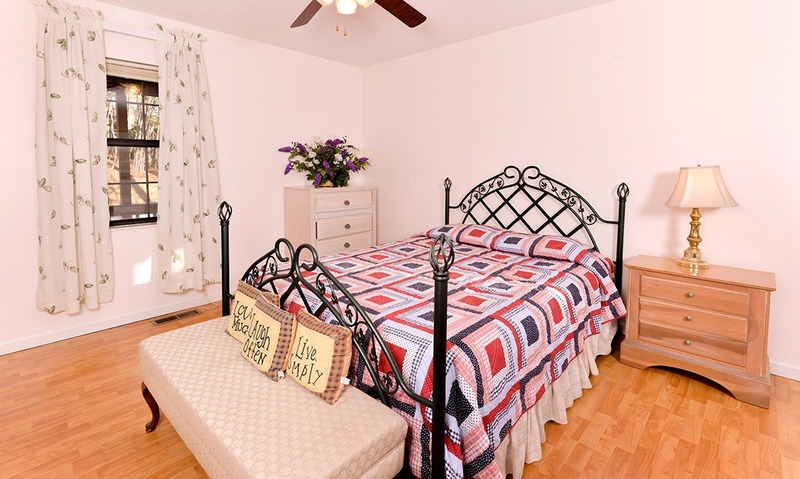 A ceiling fan, nightstand, bureau, padded bench, and reading lamp will all come in handy as you settle in for a relaxing night. 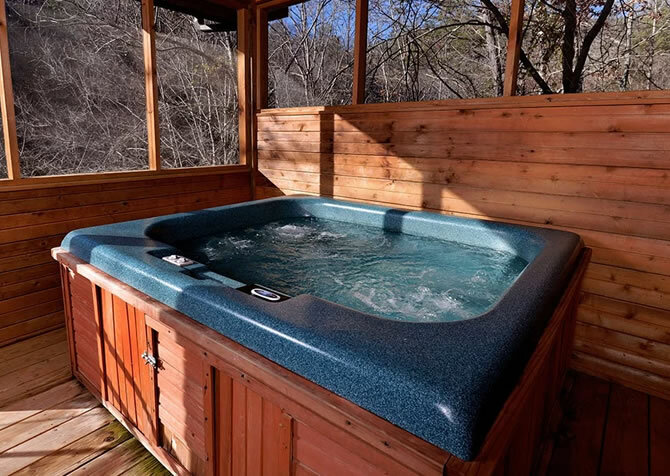 And the bedroom connects to the cabin’s only bathroom, which features an indoor jetted tub that’s perfect for soaking away stress or spending time with the one you love. Finally, this bedroom comes with a large window that offers views of the Smoky Mountain trees. Leave the drapes open so the Smoky Mountain sunrise can greet you in the morning, or close them for some much-needed rest after long days of adventuring downtown. And don’t forget—if you can’t get away from the kids for the weekend, you can still fit everyone comfortably inside Happy Days. 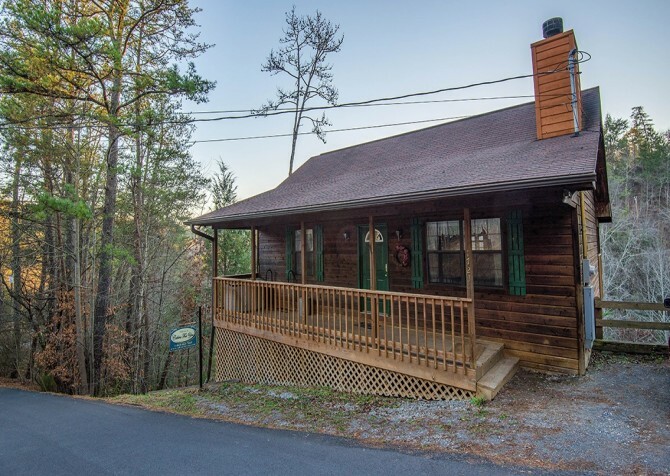 This cabin comes with a sleeper that’s just right for 2 kiddos that might be tagging along during your visit to the Smoky Mountains. 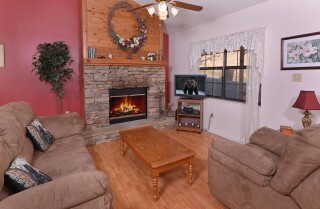 The mountain views that come with Happy Days are definitely one of this cabin’s best features. 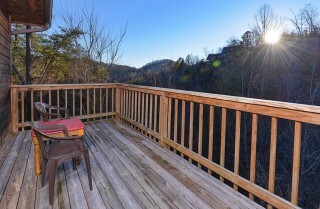 When you step onto the back porch and gaze out, you can see the rolling Smoky Mountain hills for miles. 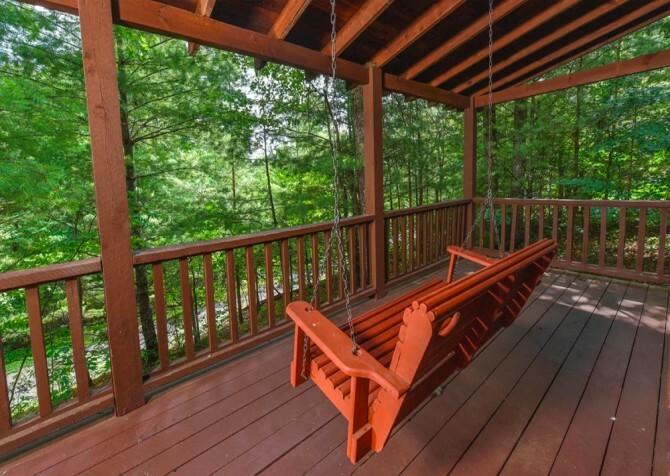 Enjoy this view from several chairs that can be found on the back deck. There’s also a small table where you can set your drinks or play a game of cards. The screened-in area of the porch features an outdoor hot tub with Smoky Mountain views at every angle. 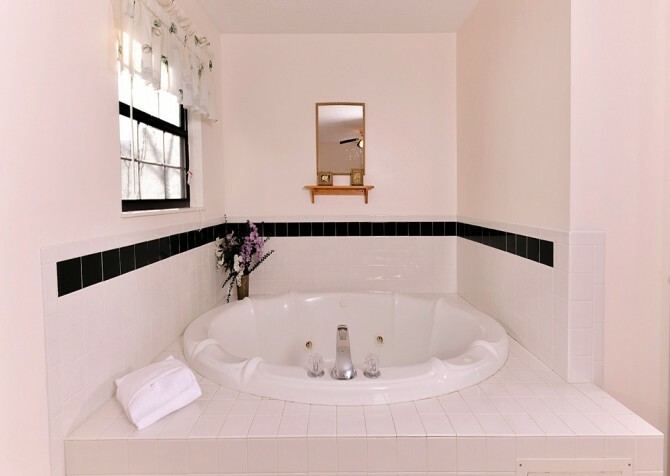 What better way to relieve your stress and enjoy time together than with a quiet soak in the evenings? You can even plan for a barbecue or grilling night during your stay at Happy Days using this cabin’s outdoor charcoal grill. Sure, you can enjoy amazing steaks in Pigeon Forge restaurants, but where else can you enjoy homemade steaks just the 2 of you with one-of-a-kind views all around? 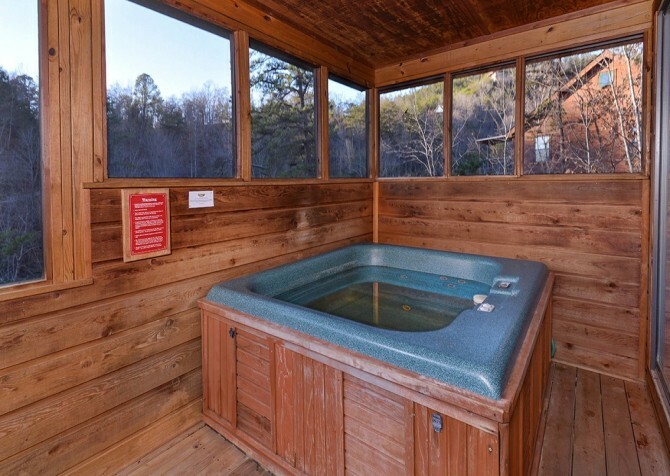 Happy Days features some amazing amenities like an indoor jetted tub, outdoor hot tub, and ironing board, making stays easier! 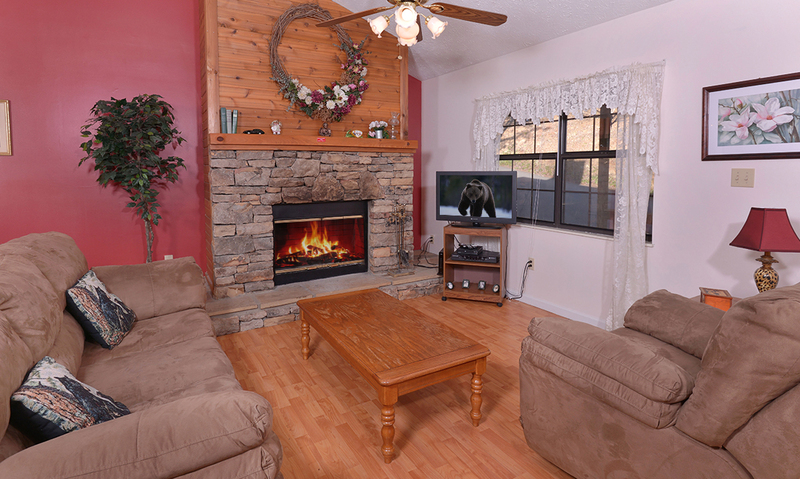 Plan to take advantage of everything inside Happy Days during your Pigeon Forge vacation. We want this romantic getaway to be exactly what you were hoping for—and more! 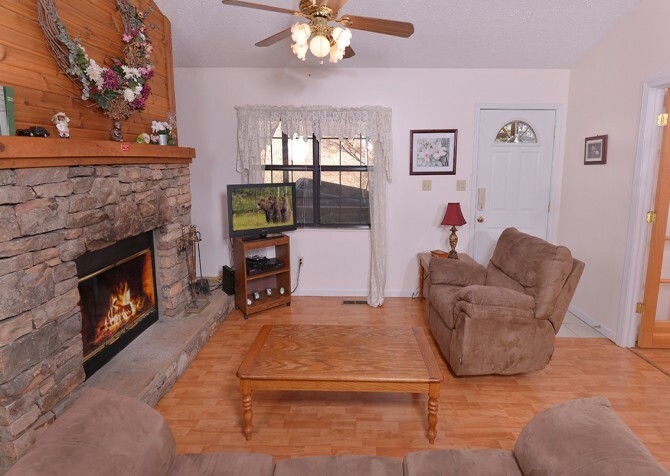 Conveniently, Happy Days provides incredible mountain views without isolating you from downtown Pigeon Forge. In fact, you can get to Pigeon Forge with only a 5-mile drive. Enjoy restaurants, shops, and these popular attractions on the days you decide to venture out. And be sure to take advantage of the Wi-Fi in the cabin to make your plans! A theme park, shopping mall, and live music venue all rolled into one, Dollywood is the perfect place to bring your loved one for a fun day in Pigeon Forge. For a unique date night, plan to spend an evening at Dolly Parton's Stampede for a rodeo show and Southern-style dinner you’ll only find in Pigeon Forge. One of the most popular restaurants in Pigeon Forge, The Old Mill (located in front of Patriot Park) features all the favorites of the South from country-fried steak to homemade pecan pie. "Son and his new wife stayed here for their honeymoon, I got them this as a gift. This is what they said.. "Great stay! We did not want to leave" Cabin is so so Awesome!. (The only fault was shower head needed cleaning..hardly any water…"
"Son and his new wife stayed here for their honeymoon, I got them this as a gift. This is what they said.. "Great stay! We did not want to leave" Cabin is so so Awesome!. (The only fault was shower head needed cleaning..hardly any water came out.) But they loved everything about it! Loved the hot tub, loved the location, loved the view! Loved the perfect cozy cabin!" They said they want to stay in the same cabin again!! It was perfect!"! Did not want to leave. Mona Hardesty"
Thank you so much for sharing what your son and his wife said. We are thrilled they had a great honeymoon, and even more thrilled that they loved Happy Days. We appreciate their feedback, and we have passed that along to the proper department. Thanks again for sharing their wonderful experience and we hope to see you all again in the Great Smoky Mountains! "My husband and I rented a cabin through Cabins for You back in August 2016 for our Honeymoon. We had a wonderful stay and our cabin was lovely. It was so relaxing and quiet but we were still close to town for the attractions. We definitely want to visit Tennessee again and we’re planning on booking through Cabins for You!"